Fun Friday Foto Fextravaganza – Pumpkins! Please check out fellow fextravagansist Catherine’s foto, as well as Stacy’s and Robyn’s (our 2 other die-hard players in this wacky game 🙂 – Robyn’s isn’t up yet, but I heard a rumor it will be later so keep your fingers crossed!) If you’d like to join in, choose a photo appropriate for ages 0-12 that says pumpkins/jack o’lanterns to you, post it on your blog, and put your link in the comments below so everyone can come visit you! OK. What else do I have to share with you today? Probably a million things, but no time! 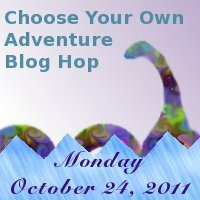 So have a donut on me, have a great weekend, and I hope I’ll see everyone here Monday for the Choose Your Own Adventure Bloghop – SO EXCITING!!! Would You Read It Wednesday – The 13th Pitch… And A Contest! I love those pictures. When I was a kid we didn't 'do' Hallowe'en in the UK. I could never work out what was going on when we saw kids dressed up on US TV programmes. Great to hear about your successful school visit. What a lovely reaction from the kids. Loved the outfit and the monster – how creative. I'm cheating for a second week with two photos. hee hee. Love it that you and Woolliam/Baahhb had a great school visit. Fun! I love the pumpkin pics. I am getting so excited for Halloween. I will be back on Monday! I love that pumpkin monster! How cool is that? Great pumpkin photos. Must be fulfilling to do a school visit and have such a great experience with kids! Have a great pumpkin dip that is very easy, healthy and great with apples and fruit — if you're interested. Brilliant photos Susanna! I should have a go at pumpkin pie sometime. I did an apple crisp at long last:) Us writers with no time to bake, but love eating lol. HAGW! Robyn – glad you like, and you're welcome! Abby – I'll look forward to seeing you Monday for the Adventure! Janet – I know, right? I wonder how they did that? 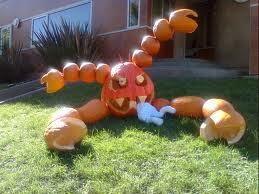 I love that pumpkin monster!!! So creative! The monster's a little weird (in a unique and creative kind of way), but I love the baby pic. 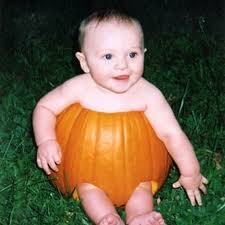 I'm seriously hoping that's not a real pumpkin the baby is in. Gross!!!! GREAT pictures! That monster one is SO CREATIVE. Blend ingredients and refrigerate. Use as a dip with apples, most fruit, or ginger snaps. It's real easy and always a hit! I love the little kid in the pumpkin! I thought at first it might be your granddaughter. Enjoy the day!